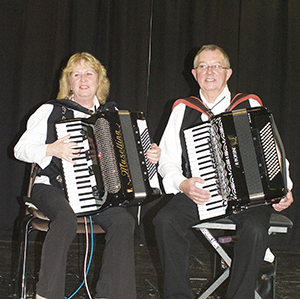 Our April Meeting, which was the 29th anniversary of Guildford Accordion Club welcomed Steve & Maggie Roxton and also Jean & Therese Dauvin. Theresa sings using the stage name “Tete Dauvin” and they travel extensively throughout Great Britain and abroad. A wide repertoire was played and a good night enjoyed by all! Fabio flew here from his native Italy to entertain us. He has published more than 30 cd’s, many of them as a band leader. He has played in various festivals including the Philippine Jazz Festival in Manilla and the Madrid Jazz Festival. Fabio has also performed at a long series of concerts around the world passing by Los Angeles, New York, London and Paris. Fabio Turchetti plays and sings alone, or in trio, his own compositions, jazz standards, tributes to tango to Italian music. A wonderful opportunity to come and see this international artist! We enjoyed welcoming in November McCool Trad. The band McCool Trad was formed a year ago by three Irish musicians. Joe O’Connor is a traditional Irish fiddle player from County Tyrone. He is a stalwart on the Irish traditional music scene, who has performed with musicians on many albums both in Ireland and in the UK. 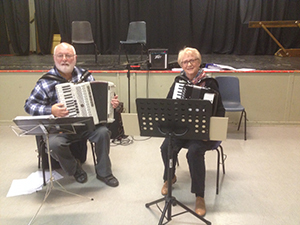 Elaine Finn Davis is a London born well-respected Irish accordionist who plays the two row diatonic accordion, whose inimitable style of playing was influenced by her father John Finn, a well-known whistle and flute player from County Roscommon. 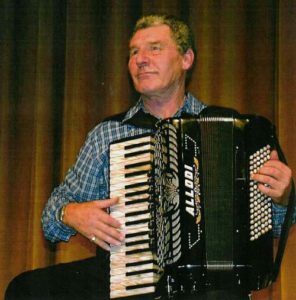 Finbarr Walsh, a piano accordionist from County Down is from a well-known family of traditional Irish musicians. Though brought up steeped in Irish traditional music, as a young man he branched out in to show band style dance music. The three met at the music festival in Ennis in 2017 and were immediately attracted to each other’s strong style of playing. They all have a very distinct style of playing akin to that played in the northern counties of Ireland, such as Donegal, Tyrone, Down and Antrim. Their music has a great rhythmic lift, which is much sought after by traditional Irish dancers. Their concerts are a mix of Irish traditional music and popular songs sung by Finbarr. Originally from Moldova Andrei began his musical studies at the age of 7 mastering the Violin and Accordion. He studied at music college in Kishnew for 9 years and then moved to Romania where he studied composition for 2 years at the Musical Conservatory in Cluj – Napoca. 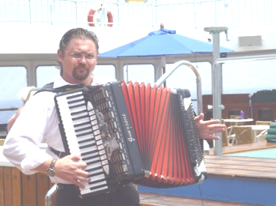 He began his musical career playing accordion in the renowned San Marco Square in Venice and from then on his love for both music and travel have led him to work all around the world either on Violin, Piano or Accordion. He spent 3 years working in Japan as part of a classical group and as a featured artist on many cruise lines. In 2009 Andrei spent a year working in a recording studio in Iasi – Romania his home town, practicing sound engineering so that he could be in control of his whole sound production. Andrei is in the process of creating a new composition but you can listen to his previous work “Alone Around The World” on ‘You Tube’. 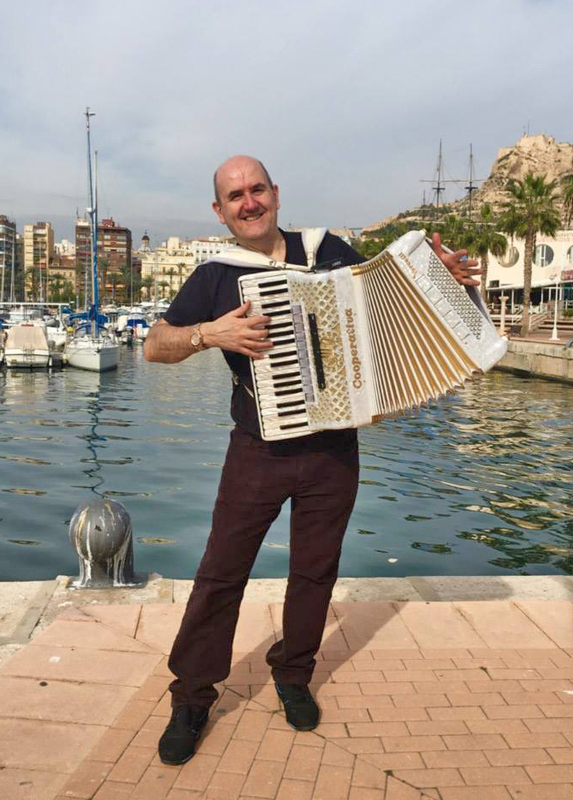 Most recently Andrei has worked as Musical Director and arranger for Entertainment Connect and travelled the world presenting his new show featuring himself on Violin, Piano and Accordion. We welcomed back Andrew and Lisa, a talented flautist and dancer, at our November 2017 meeting. 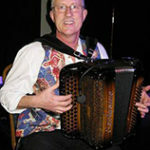 Andrew has been involved with folk music for many years. His playing draws upon a wealth of experience in other musical genres as his musical career has included playing for Le Cage aux Folles a the London Palladium, and travelling Europe with a professional theatre company. On September 15th 2017 we enjoyed welcoming Tracey Middleton and David Garwood. 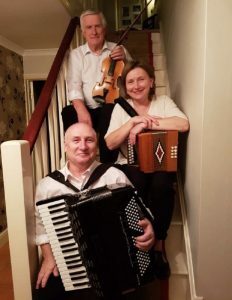 They have been playing together for about 22 years, and often appear at prestigious festivals such as Cheltenham Folk Festival and Stratford upon Avon Arts Festival. We have also seen them here before. Their diverse repertoire covered everything from 18th century dance music to Walt Disney. Our guest artist on the June 16th Club Night was Masahiro Ogawa from Tokyo Japan. He started playing the accordion at 5 years old taught by his mother who is a piano/accordion teacher. Since 12 years old he learned the accordion by himself with no other formal training. 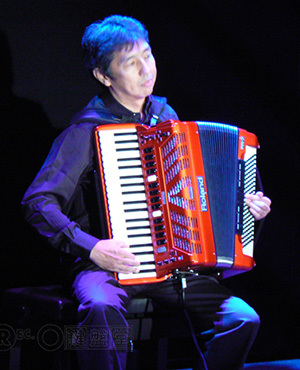 He has been a representative for Japan Accordion Promotion Conference (JAPC) aimed at promoting music of the accordion and increasing the number of players. Occasionally he organised a small group of ensembles such as duo with accordion, flute or violin for the performance at an annual concert of JAPC etc. 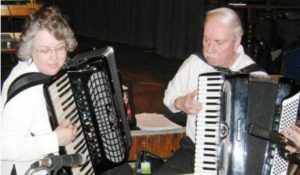 He has performed accordion at JAPC annual summer concert and concerts of other accordion clubs. 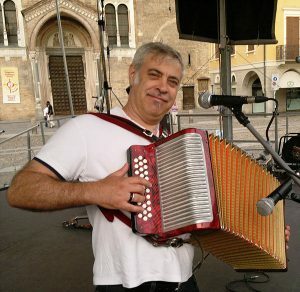 He won the number one prize at the V-accordion contest organized by Roland in Japan in 2010 and he played at the international V-Accordion contest in Rome in 2010. He was a contracted promoter of the electronic Roland accordion “Degisizer” from 1984 to 1986. Thriller, Mission Impossible, Thunderbirds, Disney Medley, Classic Medley, Jon Williams Medley, 007 Theme Medley, Spain (C. Corea), Chameleon (H. Hancock), etc. Richard Galliano, Chick Corea, Herbie Hancock, etc. 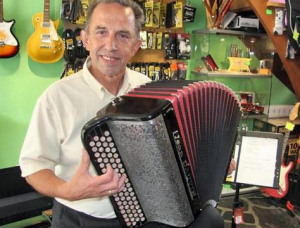 Gary is a first class accordionist able to play a wide variety of music. His fingers move at amazing speeds over the keyboard and he never fails to entertain his audience. This was a very special night and was being held to celebrate the life of our late member, Alistair Cameron who has been a great supporter of the club over the years. All profits from the night, £150, were donated to The Phyllis Tuckwell Hospice in Farnham, a wonderful place where Alistair was cared for during his illness. During the evening we also celebrated the Birthday of Myra Brooks, a great supporter of the club and a key and hard working member of the Committee. 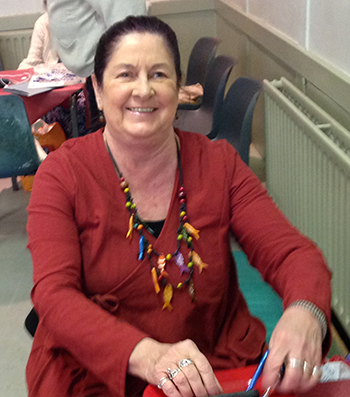 Myra id the lady who greets you on your arrival with a warm welcome! Many Happy Returns Myra! After the usual enjoyable play-along we were entertained firstly by Ivan North and Freda Davis, followed by Nigel Pasby & Helen Newton who gave us some wonderful duets. 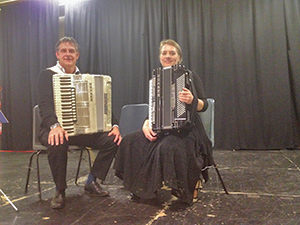 We were very fortunate to have David and Angie entertain us at our October Club Meeting. It was a superb evening and we heard some lovely duets and then David showed us what a brilliant virtuoso performer he is.